Last night, TNA performed for no more than 2,000 people, although the crowd stayed hot all night and made lots of noise. I’d have to say because of the fan interaction and the fun matches, this is my favorite of the three TNA shows I’ve now been to (including Bound for Glory 2008), and one of my top five since I started attending in 1998. To get them going, Jeremy Borash said the fans needed to make noise to win backstage passes. A staff member ran out from the back and said that AJ Styles didn’t want anybody backstage. JB said he didn’t care, until AJ Styles finally came out and said he wasn’t going anywhere. This led to the entrance of “The Freak” Rob Terry for the first match. Terry hit a few power moves on AJ Styles. AJ eventually outsmarted and overcame Terry by rolling him up and grabbing his tights. 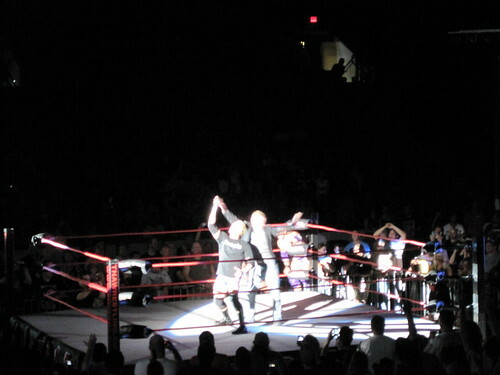 After the match, Terry grabbed the backstage passes and handed them out at ringside. TNA Knockouts Champion Madison Rayne defeated Taylor Wilde in a fun match that focused more on Rayne’s heel interactions. Very good stuff, I thought. She didn’t touch anybody, screamed bloody murder at times, and had that prissy attitude about her. At one point, Rayne ran into Earl Hebner, who grabbed her, swooped her down, and planted a big kiss on her to a huge pop. Next, JB announced that Slick Johnson was born and raised in Bloomington. I hadn’t heard that one before. Mr. Anderson defeated Desmond Wolfe with the mic check. Fans we were near kept heckling Wolfe and shouting, “Nigel!” Before the match, since the mic didn’t come down from above like Anderson expected, he made JB hand it down to him and proceeded to cut a promo about his Assholes. 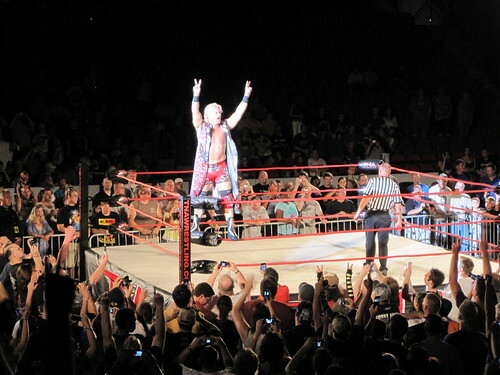 Jeff Jarrett defeated Kevin Nash with the Stroke. Didn’t Kevin Nash make enough money that he doesn’t have to be wrestling on house shows? Jarrett seemed to have fun here. Nash went on the ropes and got a lot of cheers, but Jarrett did the same and got booed. He smiled as he came down and they locked up. After intermission, Beer Money defeated Ink Inc after using almost every heel tactic in the book. I had a lot of fun watching these guys make illegal tags, seeing James Storm drink some beer after tagging out, Robert Roode spit on a fan, and lots of distraction. The finish came when Storm spit beer into Jesse Neal’s face as Roode hit a low blow on Shannon Moore, and Beer Money hit their powerbomb/neckbreaker on Moore. 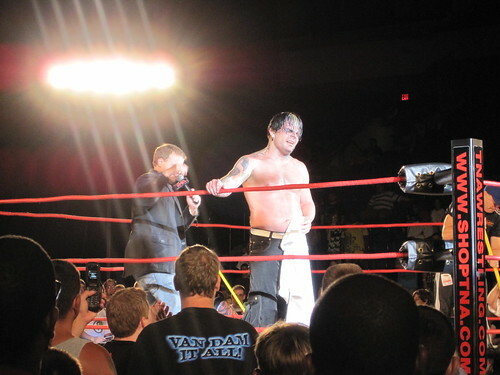 Jeff Hardy defeated Abyss in a monster’s ball match, which saw the use of a garbage can, two lids, a wet floor sign, and thumbtacks. I was really surprised to see the tacks on a house show. Jeff was crotched on the turnbuckle when Abyss poured them out. 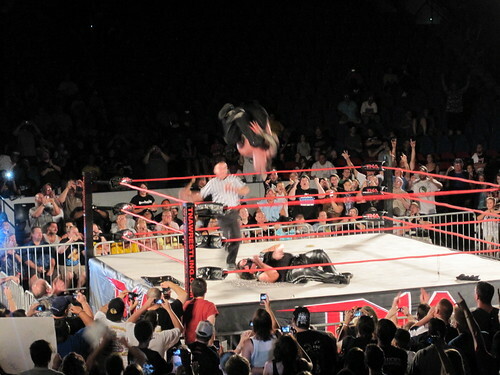 As Abyss prepared for a slam, Hardy pulled off a sunset flip onto Abyss and into the tacks, setting up for the Swanton Bomb. Before the event, Mr. Anderson was signing autographs on the floor as Don West promoted his insane deal to the house – a brand new RVD t-shirt with 4 DVDs for 20 bucks. At intermission, Madison Rayne signed while Earl Hebner was getting rid of his “Damn Right I Did!” t-shirts for half-price, since, as DW put it, he’d blown all his money on fast cars and cheap women, alleging he had 36 illegitimate children. After the monster’s ball match, Ink Inc signed autographs on the floor while fans could get their pictures in the ring with Jeff Hardy for $20. JB pulled a few tacks out of Hardy, and Hardy’s right hand was bleeding so he had to shake with his left. The US Cellular Coliseum also passed out flyers on cars noting that WWE SmackDown will be taping there on Sept. 21, 2010. This will be WWE’s first television taping at the arena. TNA Global Champion AJ Styles d. “The Freak” Rob Terry by rolling up Terry with his tights to retain. TNA Knockouts Champion Madison Rayne d. Taylor Wilde by pinfall to retain. Mr. Anderson d. Desmond Wolfe by pinfall after the Mic Check. Jeff Jarrett d. Kevin Nash by pinfall with the Stroke. Beer Money d. Ink Inc by pinfall after a low-blow and a double-team. Jeff Hardy d. Abyss by pinfall after the Swanton Bomb onto Abyss in the tacks. ← WWE NXT and Friday Night Smackdown results from Bloomington, Ill.
WWE NXT and Friday Night Smackdown results from Bloomington, Ill.